During the 2008 Detroit International Jazz Festival, the city-based Mack Avenue Records announced that Christian McBride, one of the most prominent jazz artists of his generation, had signed onto the label. For his June 16th Mack Avenue recording debut, the 36-year-old bassist/bandleader/educator/artistic director/Grammy Award winner delivers the remarkable Kind Of Brown, a 10-track album featuring his new acoustic jazz quintet Inside Stright, comprised of old friends, pianist Eric Reed, alto saxophonist Steve Wilson and drummer Carl Allen, as well as newcomer vibraphonist Warren Wolf, one of McBride's former students. This is a must get for any jazz lover. Post bop kind of tunes with just great playing by all. My only point of dislike is the way the piano is spread from the left to the right speaker... its like a 12 foot keyboard in the room. I would have preferred keeping the piano more in a space. Other than that its a fine album worthy to be in your library. 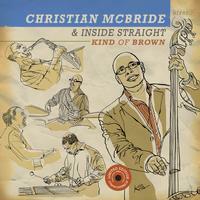 Christian McBride certainly is one of the top jazz bass players on the scene.